95 Mirage IIICs were obtained by the AdA, with initial operational deliveries in July 1961. The Mirage IIIC remained in service with the AdA until 1988. The type was also used with great success by the Israeli Air Force during the 1967 and 1973 wars. South African Mirage IIICZs remained in service for a considerable time due to a weapons embargo. Ex-Israeli Mirage IIICs were exported to other countries who wanted a capable aircraft but were unable to afford new aircraft or wanted to keep themselves free from any obligations to the US or other country. The French Armée de l'Air (AdA) also ordered a two-seat Mirage IIIB operational trainer, which first flew in October 1959. The fuselage was stretched about a meter (3 ft 3.5 in) and both cannon were deleted to accommodate the second seat. The IIIB had no radar, and provision for the SEPR rocket was deleted, although it could carry external stores. The AdA ordered 63 Mirage IIIBs (including the prototype), including five Mirage IIIB-1 trials aircraft, ten Mirage IIIB-2(RV) inflight refueling trainers with dummy nose probes, used for training Mirage IVA bomber pilots, and 20 Mirage IIIBEs, with the engine and some other features of the multi-role Mirage IIIE. One Mirage IIIB was fitted with a fly-by-wire flight control system in the mid-1970s and redesignated Mirage IIIB-SV (Stabilité Variable); this aircraft was used as a testbed for the system in the later Mirage 2000. 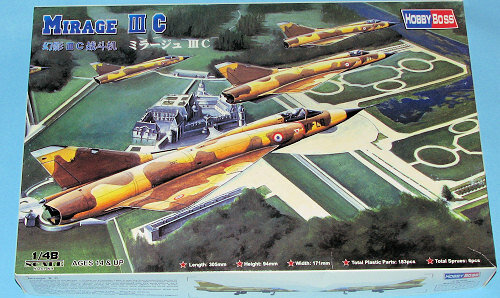 This is the second new Mirage IIIC kit to be produced in 1/48 scale in the last few years. Prior to this, Eduard did a kit that was lauded by many and built by few. I'm not really sure why this was as it certainly looked good in the box. It was also pricey, retailing at double what this kit sells for. Before that, there was the ancient Heller Mirage IIIB/C kit from the late 1960s. This kit apparently had some major fit problems, though it could be built as the two seat version. This one is all we have come to expect from a modern Chinese model maker. The surface detail is nicely engraved panel lines along with recessed rivet detail that you either like or hate. This detailing is not that great, but is there. I'm really not sure just exactly where this trend started, but the first kit I can recall having it was the Hasegawa 1/48 F-104 Starfighter. 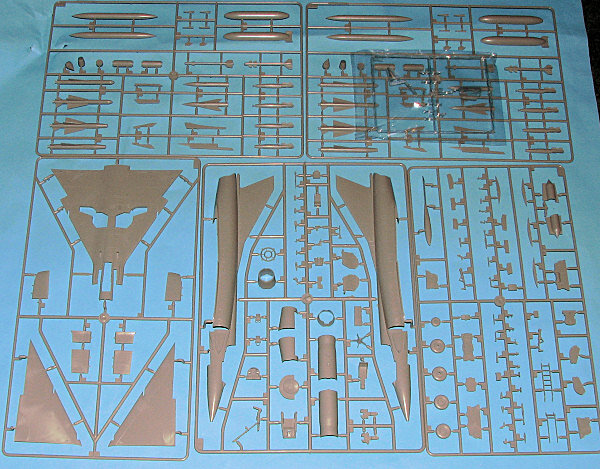 There are five major sprues with this kit and one clear sprue. Two of the five sprues are identical and carry a large array of weaponry and pylons. Naturally, not all are going to fit on the model at once, but you do get three optional large missiles (As 30, Matra 530C/K, Matra 530E/M), two sets of fuel tanks, four Snakeye bombs, two rocket pods, two Sidewinders and two Magic missiles. All are well molded though the air to air missile bodies have large ejector pin holes to fill. For the rest of the kit there is a nicely done cockpit with raised console detail. A five piece bang seat and separate rudder pedals. The wheel wells are made from several sections and have good detailing. I noticed that there is no intake trunking or blanking plate provided so I'm not sure if one will be needed. All of the elevons are provided as separate pieces, though to be honest, I don't recall seeing images of these in anything but the neutral position when the plane was on the ground. One is also provided with a boarding ladder and a positionable canopy. Instructions are well done with Gunze paint references. There is also a load-out drawing to help decide what to put where under the wings. The large decal sheet is very nicely printed and quite colorful. The color placement guide shows four different aircraft; one in an overall light blue from EC 2/10, another EC 2/10 in unpainted metal with the earlier markings that have the tricolor rudder flash and red around the intakes, a desert camouflaged EC 3/10 aircraft and a similarly camouflaged aircraft from 2 Sq SAAF. 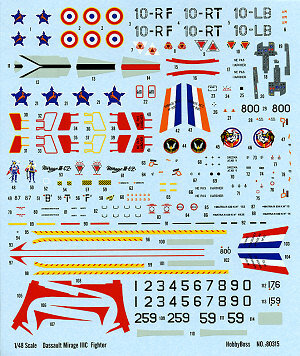 The sheet also includes decals for the instrument panels and several markings that are not called out on the markings guide. For instance, a larger set of SAAF roundels and several sets of code letters in a different font from any used. The sheet also includes the dielectric panels for the fin, which is a nice touch and will save some painting. If this is going to be typical of what we will be seeing from Hobby Boss in terms of aircraft kits, then I can foresee them doing very well. In the box this kit has all the right goodies and one isn't paying a fortune for it. I'm very much looking forward to building this and seeing how it turns out. Thanks to www.wingsntreads.com for the review kit.